Sold, giclee prints available upon request. I see the world through colorful eyes. Vibrant colors, exaggerated textures, and remarkable shapes pop out at me in nature and day-to-day life. I see blues in a grey horse, pinks in the clouds, and the negative space between branches. I see the light rays through sheer curtains and I feel the change of day through the way the sunlight glows. I see art in everything and I want to share that. Through my paintbrush, I strive to put my observations and visions down on canvas so that I can share what I see as pure beauty and emotion. Nature has always been my solace and inspiration for my palette. I have been fortunate to spend much of my life surrounded by animals and nature. As a child I discovered the magical world of horses and never looked back. The animals that have crossed my path have guided the adventures of my life. My childhood was also very centered around creativity. My parents handed me crayons and finger-paints to pacify my hyperactive and mischievous ways. I was, and still am, a creative and curious free spirit! Today I have discovered the beauty of combining all three of these pivotal life experiences, animals, nature and art. As an instructor of Mindful Horsemanship I am fascinated by the connection between human and animal. 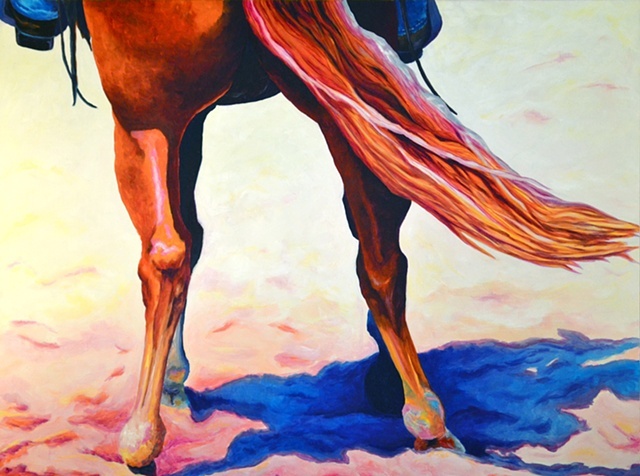 In my paintings I portray the emotion in a horse’s eye, the power of a horse’s stride and the energy of working muscles. I convey the loyalty of a beloved four-legged friend. I render the expression that a special canine has imprinted on your soul. I strive to capture not only the beauty and likeness of nature but also the deep emotions and bond that we humans are so lucky to share. Life is full of color and emotion. Hopefully, when you look away from my paintings, you too will see the world through colorful eyes.